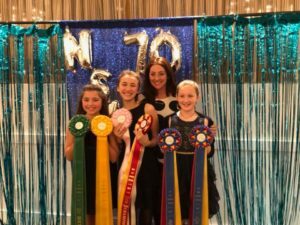 It’s that time of year again, when the snow melts, the mud grows, the hair sheds, and the horse shows begin! 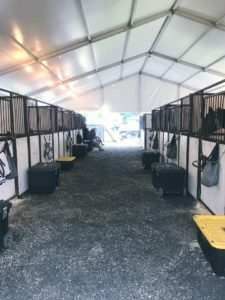 This is the time of year to get all your show tack and gear in order: clean out that tack trunk, clean those spur straps, shine those boots, wash those saddle pads! And one really important thing we want to emphasize this week is: nameplates! Remember playing ringside “martingale madness” with unlabeled martingales? We do too, and it’s not going to happen again this year because everyone’s names will be on all of their tack! We also would love it if you could monogram or label your saddle covers, since they all tend to look alike. 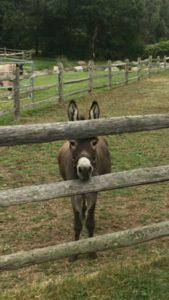 And, the most convenient news of all, is that this Thursday, March 29th, from 5pm-8pm, our friends at The Equestrian Shop in Ipswich are having a Back Bay Farm night, where riders from BBF will receive discounts throughout the store. (And they will have refreshments for us to nosh on while we shop!) That means you can order all the nameplates you need for your tack right there! And if you cannot attend, we can order them for you. Please let us know which ones you need, or we’ll assume you need them all. See you there! Winter Clothing: What to Wear! Braving the 6 degree cold! Winter has arrived with a vengeance! What winter clothing should you wear to the barn? How many times have you not been able to feel your fingers and toes in the last two weeks? How many times have you wondered why you don’t live in Arizona in the last two weeks? As much as we want to wish the cold away, all we can really do is be prepared, especially with our winter clothing. 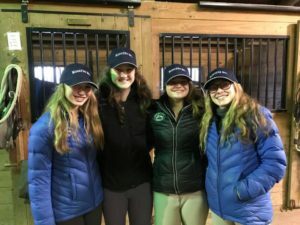 Whether you’re at the barn every day in the winter or just going for a weekly lesson, here is our advice for what to wear. The name of the game is LAYERS: you will take some off and put some back on. But the key is to have many of them. First of all, make sure you have your toes and fingers as warm as possible. Smartwool socks or ski socks inside insulated boots are great. 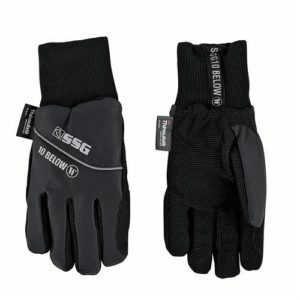 And SSG makes many options for awesomely warm, long-lasting winter gloves. You can find a ton of options at Dover. Start with a base layer—top and bottom—of long underwear. There are some great thin layers that easily fit under riding pants in both synthetic and silk. REI or LL Bean carry good options. 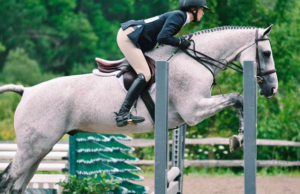 Riding pants—a few brands make of insulated riding pants, or you can get breeches a size bigger to fit a few layers underneath. 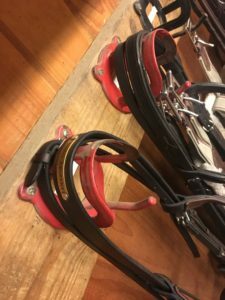 There are some good options at Dover Saddlery. Snow pants can also work will in frigid temps as an outer layer. Insulated boots: you can find both insulated tall boots and insulated paddock boots. Ariat makes several options. On top of your base layer, you’ll want a shirt, wool sweater or warm mid-layer (smartwool makes some great ones) jacket, like the Craft Back Bay Farm jackets! We recommend a down or insulated vest next, as when you’re riding you may peel down to this layer. 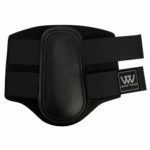 It will keep your torso warm while letting some heat out so you don’t get too sweaty (and then cold afterwards)! On top of everything you’ll want a warm coat. There are coats by horse-oriented brands like Dover, or you can find great options at any outdoor store like North Face. We also suggest a scarf or neck gaiter you can pull up over your mouth and nose, such as a Turtle Fur, and last but certainly not least, a warm hat or ear-warmer to put on when you are not wearing your helmet! 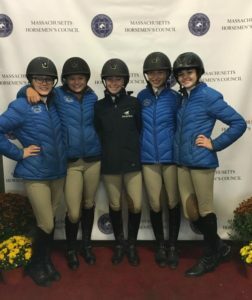 As always, check out The Equestrian Shop in Ipswich for all of these winter clothing recommendations. We know they carry most if not all of what we have suggested above. We hope this bitter cold ends soon but even if it doesn’t, at least we’ll be dressed to make the best of it. Happy New Year everyone! The girls in their BBF Mid-layer Jackets! What’s in your tack trunk? Ever just stood in front of an empty tack trunk, not quite sure where to start? Yep, we’ve seen you doing that. So here’s a handy-dandy list of what SHOULD be in your show box, besides your actual tack! At Back Bay Farm, here is what we recommend (and request) you pack in your tack trunk at home AND your away show box. Crop(s): it’s good to have a crop for showing and a crop for schooling. Nice to have different lengths, too! 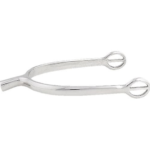 Spurs: it is best to have a nubby pair of spurs and a longer pair as well. Both should have straps that you can show in (black leather). Extra gloves: again, you may want to have a pair for schooling and a pair for showing. Both should be black. Extra hairnets: usually two come in a pack and we recommend having two packs! Also pack hair ties with them. Helmet: this is an obvious one, but some people have a schooling helmet and a show helmet. Pack both! Boot polish: this is great to have for shining up your boots right before you get on. Rubbers: for rainy and muddy days, use rubbers to keep those boots (and feet!) clean and dry. Rain pants: these should fit over your britches and boots! Saddle and Bridle: this goes without saying but we thought we’d say it anyway. Ear balls (several pairs): ear balls are just something you always want to have around, like band aids or hair ties. Have a pair and have a spare. Saddle pads: you should have extra schooling pads and extra show pads. 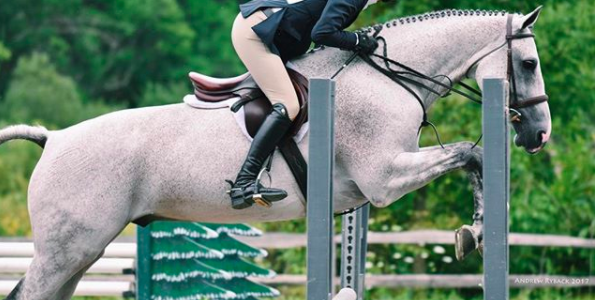 Show pads should be large enough to show about an inch around the edge of your saddle. Schooling pads should be white or dark colors, no rhinestones or glitter, please! Ear net/ Fly veil: in the summer there are flies! A lot of them! Help your horse be sane! Splint boots: bring boots for schooling, please. Polos: polos should be black and CLEAN. 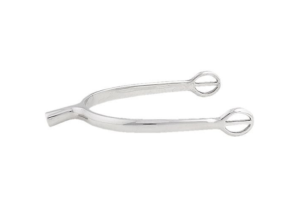 If you know you’re going to use them for schooling and showing, bring more than one pair. 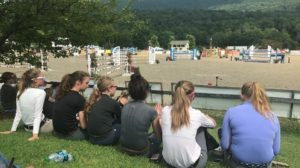 Wools: your horse’s wool is for warmth: after a bath, at the ring, etc. Scrim: scrims keep the flies and bugs off, both at the barn and at the ring. Irish: this will help dry your horse after a bath, especially if it’s cooler outside. 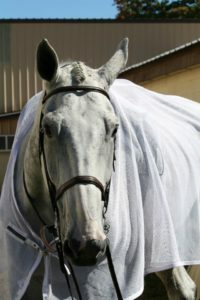 Sheet: for cooler days and nights, your horse will wear this in his stall or at the ring. Standing wraps: these are used for shipping and for nighttime wrapping. 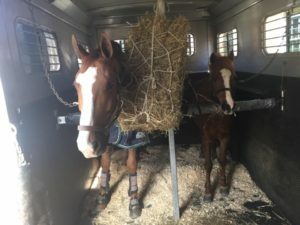 Shipping halter: it’s worth investing in good shipping halters: they last forever and are much more comfortable for your horse. 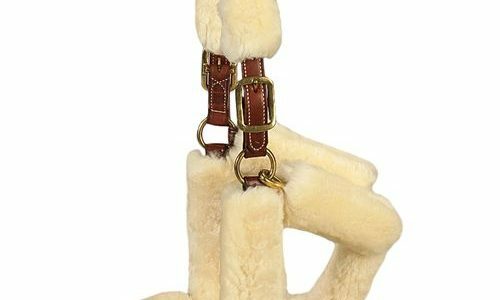 Every-day halter: your horse won’t wear this on the way to the show, so put it in your tack truck. 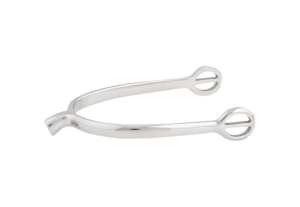 Girths: you’ll need a girth for schooling and a leather one for showing. Horse treats / cookies: last but definitely NOT least—please pack some treats for your trusty steed! 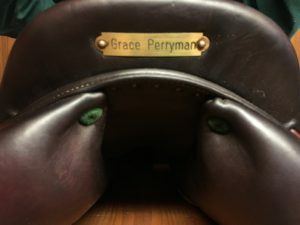 all tack, all horse clothing, and all saddle covers should be labeled with your name. 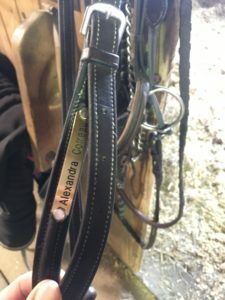 If you have questions about what nameplates to get for your tack, ask us anytime! 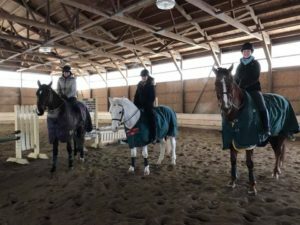 BBF riders should have BBF monogrammed wools and sheets for their horses or ponies. Please ask us if you need one!